Bob and Sally Corey of Dawsonville, Georgia, made sure they were going to see North America's tallest mountain. That's more of a challenge than you might think. Mount McKinley is often covered in clouds, and probably only one out of three visitors to interior Alaska get to see the entire mountain. So the Coreys planned ahead for their excursion off a cruise ship, doublebooking flightseeing tours on different days in late June, giving them multiple chances to see the 20,320-foot mountain. Indeed, it was rainy when they first visited Talkeetna, a quirky community about 100 miles south of Denali National Park and Preserve. Talkeetna offers some of the best viewing of the entire mountain and other Alaska Range peaks - on clear days. Numerous flightseeing tours are based here, offering bird's eye views of Mount McKinley. On cloudy days, that is the best and only option of seeing the mountain for some visitors. The Coreys took the flight their first day in Talkeetna, and the pilot was able to clear the cloud cover, allowing them jaw-dropping gapes at the top of the elusive mountain. "It was amazing. I said, 'Don't get any closer.' He said, 'We're 10 miles away,"' Sally Corey chuckled during a telephone interview after they had returned to their home north of Atlanta. "It was like you could almost touch it," Corey said. "It was massive." Many visitors wind up playing hide-and-seek with Mount McKinley, located in the heart of Denali National Park, nearly 200 north of Anchorage. The mountain is elusive to visitors partly because of the location of the Alaska Range, said park spokeswoman Kris Fister. "The range itself bisects the state, and it is the meeting point for those colder, drier systems coming down from the north, and the warmer, moisture ones gathering the precipitation from the open ocean coming in from the south," she said. As the systems collide they often produce lots of clouds, obscuring the mountain. 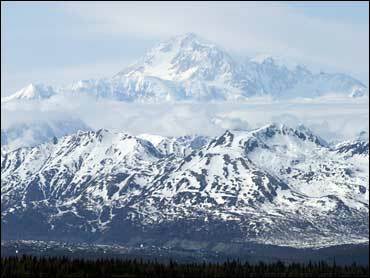 However, visitors should see some part of Mount McKinley as cloud cover changes. Fister estimated 45 percent of it is visible during most days, but the figure of one-out-of-three visitors seeing the mountain is skewed to those who see the entire mountain for a prolonged period. The mountain top can be seen from Anchorage or Fairbanks on clear days. For those driving to the park, there are plenty of opportunities to see Mount McKinley at popular pullouts along the Parks Highway - the main road that connects Alaska's two largest cities. There also are incredible sightseeing opportunities from both the south and north viewing areas on the Parks Highway in Denali State Park, which abuts the national park. The mountain can't be seen from the national park headquarters, however. But there is a road that travels 92 miles into the park. Visitors are allowed to drive their vehicles only the first 15 miles, and the mountain is visible at times only after mile 10. To go farther inside the park than 15 miles, you must get on a bus. But even as majestic as Mount McKinley is, Fister says that perhaps is not the biggest priority for park visitors. "They'd like to see a grizzly bear," she said. She said the bus rides offer not only more chances to see the mountain, it also gives riders the best opportunity to see the park's incredible menagerie of wildlife. "To have the opportunity to see these species of wildlife - moose, caribou, bear, wolf - in their natural habitat, to me is unequivocal. There is nothing to compare with it," Fister said. "And then, if you get to see this huge mountain, that is the highest peak in North America, that sort of just totally tops it off," she said. But if seeing Mount McKinley is your goal, you can't beat the views from Talkeetna, about 14 miles off the Parks Highway. One of the best pullouts to see Mount McKinley is just before driving into the eclectic town, which has 800 residents. Another prime spot is the nearby Talkeetna Alaskan Lodge, where stunning views of the sweeping Alaska Range can seen on clear days from the inside the lodge - behind large windows in the lounge area warmed by a large stone fireplace - and a viewing deck outside. Mount McKinley is the No. 1 reason tourists visit Talkeetna, said Kris Dupey, who works at the local visitors center. "If they can't see it, they're pretty upset," said Dupey, who attempts to get tourists hooked up with local flightseeing companies to get above the clouds. If that's not possible, she tries to find other things for them to do: river rafting or jet boat tours (Talkeetna is at the confluence of the glacier-fed Susitna, Chulitna and Talkeetna rivers), one of the three museums in town, tourist shops, the new ranger station or miles of hiking trails - with appropriate warnings about moose and bears (both grizzly and black). Prominently parked on Talkeetna's main drag is Harvey Phillips' taxi, a covered wagon pulled by two mules. He offers to take tourists to see Mount McKinley, if it's not hiding behind clouds. "All I can promise is that when it's out, I will take them where they can see it," said Phillips, who straps two pistols in case of bear attacks. "And unfortunately, most of the time I don't get to take them very far because they don't get to see it." Customers don't get irate, he says; they're just very disappointed. "They spend a lot of money to come up and see it, and you know, nature just doesn't allow that all the time," Phillips said. This is the fifth year Phillips has spent summers in Talkeetna and winters in Florida, and he never tires of seeing Mount McKinley. "After all the years I have been coming up here, it still takes my breath away, and I don't pass up a chance to see it," he said. Neither does Rolland Hippe of Madison, Wisconsin, who this summer made his 40th or 50th trip to Alaska; he's been here so many times over the years visiting family and friends that he's lost count. During those many visits, he admits, he's seen Mount McKinley more often from Anchorage than from Talkeetna or the park. During a recent visit to Talkeetna, clouds and rain obscured any view of the Alaska Range. Hippe, like many visitors, held out hope the clouds would move out. "When I came out, it was raining, but you might get a chance to see it today," he said. Would that make him happy? "You bet," he says. "You bet it would."